Robert (B.J.) 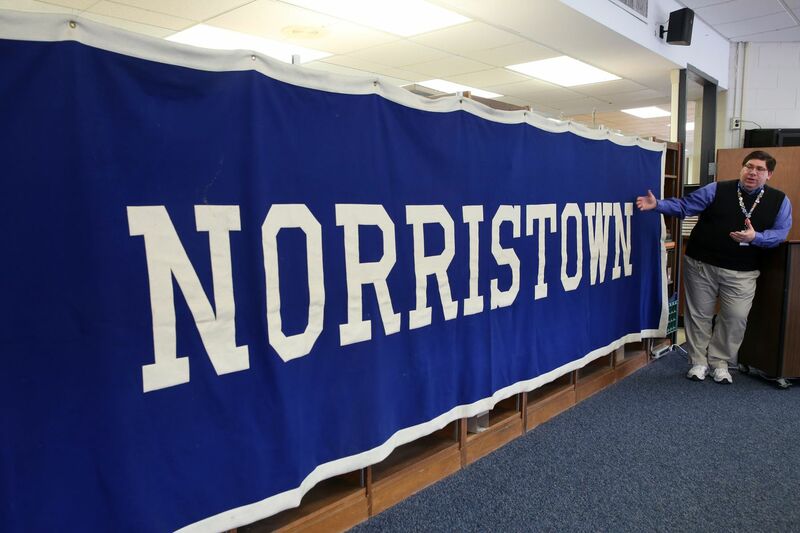 Schmalbach, high school librarian and 95' alumni shows off Norristown banner in the library at Norristown Area High School. Hooked on phonics? Not in this school district, and parents say the result is kids can’t read. In just seven months, the school district, which includes Norristown and East and West Norriton, has have unveiled a new logo (a distinctive block “N”) and begun working on a redrawn eagle mascot, hired a communications specialist, and launched new accounts on Facebook, Twitter, and Instagram — all toward a goal of bringing back a positive vibe. Norristown has joined a growing number of Philadelphia-area public school districts where superintendents now talk of “building their brand” in the same enthusiastic tones as cola executives or internet start-ups — and often are willing to invest energy and tax dollars in PR firms or designers to make it happen. Rebranding efforts in Norristown, Upper Darby, Coatesville, and elsewhere are partly due to increased competition for students — and the dollars attached to them — with heavily advertised cyber- and brick-and-mortar charter schools, as well as private and parochial schools. But school leaders also insist it’s an effort to counteract negative news headlines in an era of tight budgets and culture wars in the classroom. In the Upper Darby School District, officials say the $70,000 authorized in December to hire Magnum Marketing is creating a campaign to not only highlight what’s positive about the district’s diversity or academic achievements but also drive community support for its plan to build a new middle school and refurbish existing schools. Daniel McGarry, superintendent of the roughly 12,000-student Delaware County district, said the rebranding “is about changing the image of how people perceive Upper Darby and make these areas points of pride.” He noted that an image overhaul would also help Upper Darby attract top teachers in a competitive marketplace. In Norristown, high school librarian B.J. Schmalbach, a 1995 graduate of the high school, was tapped to research the history of the district, which started in 1836 and merged with East Norriton and West Norriton in 1966. The goal, he said, was to infuse tradition into the new logo and colors. Today, the district has 7,100 students in 12 schools. The Norristown rebranding is mostly an in-house, lower-budget effort — working with district employees or existing vendors. New athletic uniforms will have to be phased in because of cost. Instead of dollars, many of the projects focus on enthusiasm and participation — such as a student contest to pick a new eagle mascot, followed by a big launch party. Of course, better messaging only works when you have something to sell. Norristown is pushing a sweeping new-technology agenda that aims to provide 1,200 new devices in the schools every year for five years, while working with the Sprint Foundation for 800 new WiFi hot spots across the district. That’s in addition to a major new early literacy initiative and a fine-tuned emphasis on 21st-century job skills. The growth of charter schools that compete for students and often advertise heavily on radio or social media has clearly been a prod for school districts to think about their brand in ways they didn’t before. Norristown currently pays almost $3 million of its $38 million budget for about 500 district kids to attend charters, and Dormer said he’d love to woo some of them back. “I believe that many leave due to perception,” he said. In the Coatesville Area School District, which hopped on the rebranding bandwagon in 2017, the loss of 800 students to competing charter schools in just three years was a spur for its campaign that included hiring a new communications firm and sending out glossy mailers. Rob Fisher, who became Coatesville Area school board president after the rebranding was underway, conceded that so far the effort has done little to stop the charter-school exodus that costs the Chester County district $40 million a year.